We learned the name of the new Mario Kart today. And it's...(pause for effect)...Mario Kart 7. But there have been, in fact, nine Mario Kart games- come along, count with us— and take a look at some of the commercials made for them too! The first. The grandaddy. The classic. I played this game for years. And the commercial for it was totally rad. Mario Kart part deux! And the one I played the least, sadly. I never had a N64. Sad. But a commercial this trippy wouldn't have convinced me to buy one. I hate clowns. Mario's third outing, and the first you could take on the road with you, as this (pretty great) TV ad illustrates perfectly. The fourth, and probably my favorite. I still play Double Dash to this day. It's a hit at parties. Really. 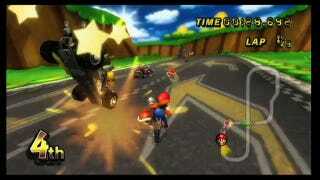 This installment, the fifth in the series, and its follow up would be the only Mario Kart entries to not be developed by a Nintendo-owned studio. Developed jointly with Namco, you should try playing one if you've ever wanted to see Pac-Man hurling red shells on the tracks of Mushroom Kingdom. Don't believe me? Check out the gameplay. Numba Six, the first Mario Kart with online multiplayer. For some reason that equates to flinging pizza through televisions. Advertising is weird. The actual seventh Mario Kart, it's also the latest version of the game to play in an arcade. I saw it at a Dave and Buster's once, but apparently no one was in a sharing mood that day. This saddened me. I wanted those guys to see my portrait zip past them with a mushroom perched on my head. The eighth, and latest Mario Kart grace store shelves until the new Mario Kart 7 (cough) hits for 3DS this holiday. It also had a wheel for your Wiimote, as these annoying commercials incessantly would remind us. Your next (and ninth!) dose of racing plumbers is due out this holiday season. There's no cool or quirky TV spot for it yet, but there is a video of our own Stephen Totilo playing it. He's a pretty cool guy, so I suppose you could watch that.